This month the Harvard Business Review asks a pertinent question; “what makes a great leader?” From the image accompanying question, the answer seems to be “a white guy”. We know that images have a bigger impact than text, we know that role models are hugely important, so I decided to tease this out a little and have a look at what happened when I searched for images of “leader”. 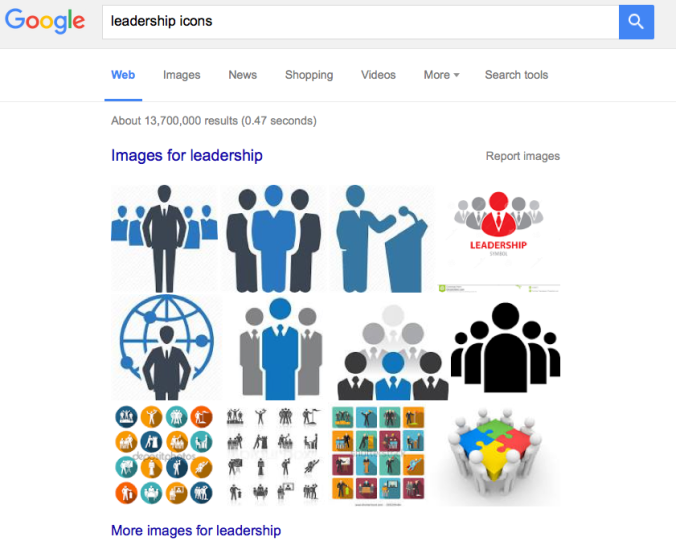 The first search I did was “leadership icons” on Google. I thought that by using a search for icons the results would be relatively untainted by any news items. Here’s the result. Most of the icons are explicitly male, and wearing a tie. Apparently that’s our standard impression of a leader. In fact when I clicked on “more images for leadership” I still had to scroll past about 80 images to find one that had a figure that could be identified as specifically female. Let’s call her Eve, here she is. You’ll notice that Eve is ahead of a group of people as if to lead them, but she’s not alone. Apparently Adam can lead alone, but Eve cannot. 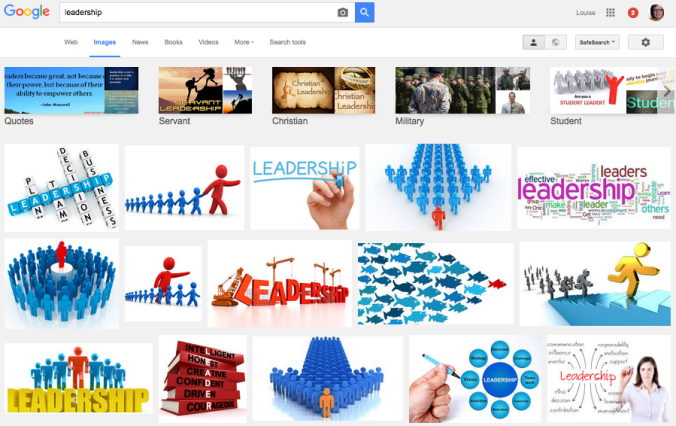 If I search for “leadership” in Google there is an image using a fish metaphor for leadership that ranks higher than any image featuring a woman. That’s just one search engine, do others perform any better? Bing and Duck Go Go deliver roughly the same set of images. My hopes rested on Yahoo!, with a female CEO perhaps it would be reflected in their search results. I tested it and the answer is, maybe. At position 45 there is an icon of a woman leader. A leader who bears a passing resemblance to Marissa Mayer, in as much as icons can resemble people. However she’s very lonely on the page, I found no other representatives of women leading in the next 50 or so images. Just for fun I tried the same test looking at “programmer icons”, the results were depressingly similar, although google did manage to have a female appearing icon in the first group. I’m not blaming Google et al for this, search results are a reflection of our collective choices, over the lifespan of the internet we’ve created more images of men as leaders, and chosen images that depict tie-wearing males to represent leaders. I’d like to see this imbalance redressed; perhaps if we all started depicting leaders with a range of icons and images reflecting the range of people in leadership roles. And any designers out there working on icons, or photographers working on stock images, please include a gender balance and a mix of ethnicities in your depictions of all occupations. Of course changing the number of icons won’t automatically result in massive increases in the number of female CEOs, but it may help women leaders be seen as normal, and help young girls and people of colour to have that level of ambition. Going back to the HBR issue; it features an article on the 100 best CEOs of this year, of which just 2 are women. The “white guy” on the front seems to be Lars Sørensen who topped the leader-board this year.